Having trouble with dated, pixelated graphics? We love a challenge! Our talented team of designers can take your low resolution (.jpg, .bmp, .tiff, etc.) images and redraw and vectorize them, giving you a high resolution image that’s sure to please. Better quality images will help keep your brand looking polished and attract your customers’ attention. Searching for printing pad fixtures that don’t seem to exist? We love a challenge! We can customize and manufacture a solution for you in aluminum, urethane compounds and a variety of other materials to meet the needs of your specific application. A TampoPrint fixture is the perfect compliment to any new or used TampoPrint equipment setup. Want to see a sample of our work before committing to a whole run? We love a challenge! Test printing from our library of TampoPrint images is always free, or we will work with you to perform test prints on your products or prototype samples. Let us prove why we’re the best at what we do. Want to see your image marked on an unusual surface? We love a challenge! Our creative team has actually laser etched a logo on a delicious green apple, just to show how sharp and precise an image our equipment can produce. We’ve got the video to prove it! Whether you’re looking to purchase the equipment to do it yourself, or give us the job, send us your ideas and we will work with you to create a product that your customers will come back for time and time again. 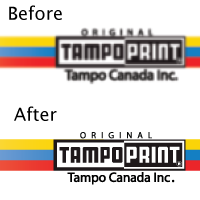 At Tampo Canada, we will rise to meet any challenge you have for us. From start to finish, let us show you how our services, equipment and consumable products will give your business a competitive advantage in with your customers.